Tom Kenny, one of the most successful voiceover actors in the business, would be the first to admit he took an unusual path to his life behind the microphone. "I did everything wrong," he reveals. "Maybe not wrong, since it worked out, but I never followed the track one is supposed to take for a career in this business. I never formally studied voiceover or took classes. I never made, and still don't have, a demo tape or CD. I'll get around to it one of these days." Not that he's likely to find any time. Kenny is the voice behind the worldwide phenomenon "SpongeBob SquarePants," on which he voices the lovable title character: a childlike and optimistic yellow sponge who, as the song tells us, lives in a pineapple under the sea. Since its premiere, on Nickelodeon in 1999, "SpongeBob" has become a media sensation, spawning copious merchandise, a hit feature film, and the likes of Bruce Willis and Sigourney Weaver among its fans. Meeting Kenny in person at the colorful Nickelodeon Studios, in Burbank, Calif., it's not hard to believe Kenny was chosen to bring SpongeBob to life. Gregarious and—for lack of a better word—animated, the actor seems to share an upbeat attitude with his yellow alter ego. "It's virtually impossible to be in a bad mood after playing SpongeBob," he says of the weekly recording sessions at the studios. "For those four hours I'm in Bikini Bottom, it's bliss." Kenny's everyday voice sounds nothing like the character's; indeed, the actor has no problem slipping into a wide variety of voices at a moment's notice. He can race through a script, switching up voices with precision. But Kenny can play more than just an innocent aquatic Porifera; the hard-working actor has also contributed voices to a wide range of roles on such animated series as "Phineas and Ferb," "The Powerpuff Girls," "The Super Hero Squad Show," and "Star Wars: The Clone Wars." Then there are upcoming movies ("Winnie the Pooh," "Transformers: Dark of the Moon"), commercials, video games, and miscellaneous jobs like announcing the Nickelodeon Kids' Choice Awards. It's not uncommon to find Kenny playing several different characters for different shows within one day. He shows no sign of slowing down. And though the world of voiceover acting has distinct advantages over on-camera work, it's not mere kids' play: There are still issues of typecasting and a star system to battle, even in the world of animation. Kenny developed a love of performing and cartoons at an early age. Growing up in Syracuse, New York, he was writing and drawing comic strips and acting out comedy skits while still in grade school. He was joined by several friends, including his best friend since the first grade, Bobcat Goldthwait, who would become a successful standup comedian and, later, filmmaker. While still in high school, they began to set up comedy nights and broke into standup by answering an ad in the Syracuse New Times, a free local publication. Neither knew anything about how to navigate the business—which Kenny says worked to their advantage. "The fact that there was no paradigm for us to follow enabled us to go to local businesses and say, 'Hey, we want to start a sketch comedy night here in your bar. What do you say?' " Kenny recalls. "We sort of had to build the machine a little bit. In our own dopey, do-it-yourself way, we figured it out." Kenny and Goldthwait performed in a band, The Tearjerkers, and formed a sketch group, The Generic Comics, in honor of the generic-products aisle at the local grocery store where they both worked. "We learned to write and act in front of sympathetic local audiences," Kenny says. Goldthwait eventually moved to Boston to continue pursuing standup, and when he was moving to the West Coast in 1983, Kenny took over his lease and left Syracuse behind. He eventually came out west and spent eight years "doing standup and going on the road, playing every comedy club with a brick-wall backdrop." He even landed a role as an ensemble player on Fox's short-lived sketch show "The Edge" and later performed on HBO's "Mr. Show With Bob and David." Though Kenny enjoyed his time in comedy, he says he didn't feel a passion for it as his peers did, and soon he realized it wasn't his main skill. "As a comic, I could get the job done, but I wasn't quite mainstream enough to be in the Jeff Foxworthy annals—someone who goes out every night and kills," he says. "And when I started breaking into voiceover, it became apparent to me that that was the best use of my skill set." Kenny's first break into the world of voiceover came via Joe Murray, who created an early Nickelodeon toon called "Rocko's Modern Life," about the adventures of an Australian wallaby and his friends. Rocko was voiced by comic Carlos Alazraqui, who recommended Kenny to Murray, having seen Kenny's standup act. "I didn't do impressions—I almost fled from that, because it was hackneyed," Kenny says. "But I had a wide variety of characters and voices I could do." From the first moment he stepped up to the mic, Kenny says, he knew he was at home. "I felt like I belonged; it was where I should be," he says. "I liked it a lot more than shooting something on camera or being in a comedy club in Michigan on a Saturday night." Though Kenny would also contribute voices to shows like "Animaniacs" and "Dexter's Laboratory," "Rocko's" led him directly to "SpongeBob." 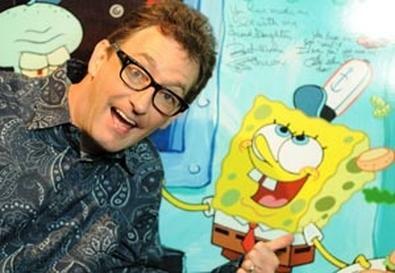 Murray had hired Stephen Hillenburg, a creative director who had never worked in animation before. Hillenburg had previously studied and taught marine biology and penned a comic book, "The Intertidal Zone," which featured anthropomorphic sea creatures. One day, Hillenburg showed Kenny an idea for his own show he was thinking of pitching to Nickelodeon. "He kind of shyly brought out these drawings and told me the idea of this sponge, and I just loved it," Kenny recalls. "He said, 'Do you know what this guy would sound like?' I was instantly like 'Yes, yes, please!' I immediately felt like if anyone else got the job, I would be very sad. I can't explain it; it just felt right. I let him know that I would love this and nurture it the way he would." The voice for SpongeBob came instantly—Hillenburg remembered a voice Kenny had done for a minor, throwaway character in a crowd scene on "Rocko's" and wanted a similar voice for his lead. "He said, 'That's how I hear this guy. He's not quite grown up, he's not quite a kid, he's a bit of a Pee-Wee Herman type. He has a job and lives by himself, but is basically a kid in the way Laurel and Hardy and the Three Stooges are,' " Kenny reveals. "Another go-to was early Jerry Lewis, because he's a grown man who acts like a spazzy child half the time." A seven-minute pilot was recorded in 1997, and in 1999, "SpongeBob SquarePants" premiered on Nickelodeon. Though it wasn't a runaway hit in its first season, the show soon garnered a following that can best be described as fanatical. Asked when he first realized the show had become a pop culture phenomenon, Kenny says, "I think it was a couple seasons in, when you just started seeing products all over the place. And just from talking to people, it became apparent that they were intensely involved with the show. They couldn't get enough of it. It's hard to believe now, but there was a time when people were waiting for SpongeBob product to come out. They would ask, 'Will there be plush toys? Where can I get a T-shirt?' "
Despite the global scale of "SpongeBob," Kenny says the group behind the scenes is fairly small, and most everyone working on the show has been there since the beginning. The ensemble cast—which includes "Coach" star Bill Fagerbakke as SpongeBob's slow-witted best friend Patrick the starfish and character actor Clancy Brown as cheapskate boss Mr. Krabs—records one 11-minute episode a week together, which, in voiceover, is not always the norm. "I much prefer it that way," Kenny says. "It's not harder, per se, and in some ways, recording in a vacuum is nice because you're in and out in 20 minutes. But I'd rather have a couple extra hours and have that interplay and improv with the other actors." While not every show encourages improv, Kenny says "SpongeBob" has something they call the "crazy pass" for each recording. "You do the scene twice as written, and then you have your anything-goes pass on the third one," he explains. "Those are quite often the ones they end up using." Though Kenny still performs on-camera work from time to time—most notably as Patchy the Pirate, the sometimes host of "SpongeBob"—he finds many advantages to being an unseen actor. For starters, there's a lack of ageism in the industry. "Voiceover is probably one of the areas of show business where I'm the youngest guy in the room," he says. "Everywhere else, it's like you're done by 35. All of the guys who got into it before me, who are a generation ahead of me, still work every single day." And though typecasting exists to some extent in voiceover, it's nothing like in the on-camera world. "I felt like it was hard to get people to think outside the box. It would be: 'Tom wears glasses. He goes in the nerd file,' " Kenny says. "But there is some difficulty at times convincing the powers that be that you can be versatile and do different things. Yes, I do crazy comedy, but I would really like a crack at doing some of the superhero shows." Another issue in the world of voiceover is the trend of movie stars doing roles in animation. "Getting leads in animated features is very difficult," Kenny says. "It's very star-driven; they'll look at who's big in movies and have Steve Carell or Will Ferrell or Johnny Depp do the voices." Kenny says he has made peace with the issue. "I don't let it frustrate me; it is what it is. They're movie stars, and I don't want to be a movie star. You just hope some of the other roles will find their way to you. And a lot of times, if a movie goes to series, the celebrity can't do the day-to-day work." And it is work, he points out. "I've been at sessions where a celebrity is like 'This is hard!' They're very kind and impressed around the voiceover guys and say, 'You just had a four-minute conversation with yourself in that scene!' "
Another misconception about voiceover work is that once you play a recognizable character, you don't have to audition anymore. Kenny is quick to note that he still auditions, almost every day, and adds he'll audition for anything—to the point where his agent, Marcia Hurwitz at Innovative Artists, uses him as an example to her new clients. "I'm the guy who will drive 50 miles to audition for something, even if the money ain't great," he says. And he's open to working with anyone. "It's about the people you meet along the way—it could be that kid whose student film you did at USC who ends up with a series at Cartoon Network." Unlike many voice actors, Kenny doesn't have a home studio. "I don't want to be making voices in my linen closet. That's where we keep the towels," he quips. "It's probably psychological on my part because I have kids, but I like keeping my place of work and my home separate entities. Also, I'm in Burbank literally every single day, where all these studios are that I can use." He mentions businesses such as Voice Caster and Voice Trax West that offer "V.O. and go." Kenny explains, "You go in, it's 10 bucks for 10 minutes, and you take your copy. Then, they send an MP3 to your agents. In addition, you get a great director with good ears who says, 'Try it this way!' I book a lot of stuff, I think in large part, because the people running these studios know what they're doing." Most important, Kenny says doing voiceover isn't about just reading out loud in a funny voice. "Really, it's about inhabiting a world and a character and having fun with it. It's like any other acting in that you get in that zone and be that character," he says. "On every show, I just try to figure out how to be as effective as possible and further the creator's vision because it's their show, it's their baby." He confesses, though, to having moments of exhaustion—SpongeBob does a lot of screaming and goes through emotional highs and lows—and even frustration. "There are moments I'll hit a wall and think, 'I've just said, "Part of this good breakfast" 492 times.' Or you'll get direction like 'Sound crunchier!' " he says with a laugh. "But let's not forget, the worst day that you have doing voiceover is still probably as good as the best day you've ever had working a day job you had no interest in." – Appeared in Bobcat Goldthwait's films "Shakes the Clown" and "World's Greatest Dad"
– Says he was always drawn to character performers, such as Ernest Borgnine, who plays superhero Mermaid Man on "SpongeBob." Says Kenny, "That's what I wanted to be as a kid: a great character actor. I'd see the good-looking, bland leading man on TV and never wanted to be that guy. But I'd see Mr. Whipple squeezing the Charmin and think, 'That's a pretty cool job! How can I be Mr. Whipple for 50 years?' Who wants to be James Franciscus when you can be Ernest Borgnine?"